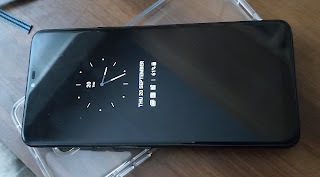 Selling the LG G7 ThinQ to most people really wouldn’t be a difficult task if they were to keep it for a couple of years. It’s got Android 8.0.0. (with the promise of Pie ‘soon’) out of the box with July 2018 Google Security and list of spec’s on paper just can’t be argued with by most sane people! Then there’s us! LG continue with that ‘disproportionately tall’ thing which seems to be the trend and include an annoying ‘notch’ into the bargain. The notch can be hidden in the system screens but not inside many apps. App Scaling helps with some apps but doesn’t get rid of the dumb ‘ears’ in most. I guess it’s what you get used to, but I’m not - and it just looks stupid. On the plus-side for many, they’ll think that having virtually no bezels, like here, is a big advantage. Until they realise that to hold the phone any sense, they need to have a case on it! Which it really needs anyway, as usual with most modern phones. Apart from that gripe, the screen is an IPS LCD 6.1” beast which, because of the 19.5:9 ratio really doesn’t look it and the footprint seems really much smaller. Very much like the G6 before it. It fits in the smallest of hands snugly and helps with grip. The screen can be set to the default 1440p but also dropped to 1080 or even 720 for those with really knackered eyes! The Dolby Vision/HDR10 compliant screen is very bright and even has a ‘boost’ setting which will really brighten things up for a short time, though note that it turns itself back down again after 3 minutes to save battery. LG claim that this is the brightest display that they’ve ever produced, so I put it up against the Nokia 8 to test that. Sure enough, the G7 is brighter in Boosted Mode (and has better viewing angles before a cast creeps in) but the 8 can stay on. Screen ‘colour’ can be adjusted in Settings with very fine controls to make the panel look how you want it to. Gorilla Glass covers the front and back, which some will argue is great for shatter but less good for scratches and GG3 would have been better. The two glass panels are held together around the perimeter by a ring of aluminium and it feels premium. The glass curves round more on the back than the front, though the front is not completely flat either. In the hand, it’s not as big, nor ‘boxy’ as the design used on the G6, but then that had a bigger battery too. The battery here is a 3000mAh one and on testing in these first few days it feels like it’s good for a day (as always depending on how you use it) but not more. To counter this, LG have included Qi Charging and QC3 for handy (and quick) charging when needed. The Power button is on the right and Volume keys on the left with an extra button below them which fires up the Google Assistant without having to invoke it in other ways. However, this doesn’t work if the screen is off and device locked. You have to press it, then unlock (or face unlock), then carry on. Reasonable for security I guess, but if you’re the kind of person who makes use of the Assistant then this is very handy and much more useful than Samsung’s Bixby thing! At the bottom is the single speaker and 3.5mm Audio Out socket, which I’ll come to, and the USB-C port. Up top is the Card Tray, in this case offering microSD and SIM or 2 x Sim and no microSD in the most common way. Regional variations apply to this array. As they do with RAM and storage. This UK model has 4GB RAM and 64GB Storage but there is a 6GB/128GB version out there somewhere. As usual, not officially in the UK. Sigh. The Snapdragon 845 ensures that the device speeds through any numbers of tasks thrown at it as you’d imagine. Everything is fast and lag-free. On the back is the camera cluster and fingerprint scanner underneath, just in the right place for most hands. I’ll come to the camera options later. The device is certainly not as heavy as the G6 and boasts IP68 weathering, dust and water (1.5 metres for half an hour). The build is MIL-STD-810G compliant apparently, not that most of us will test that ever! The G6 before it, along with V-series LG phones had true always-on functionality and the G7 is no exception. It works in just the same way with a range of options to choose from, clocks, signatures, notification and battery information, with that handy scrolling display getting you from the screen-off state to various settings directly which don’t compromise sensitive data, like Camera, Bluetooth, Torch, Wifi etc. If you have music playing the next swipe will get you to basic controls for that too - Pause, Skip Forward/Back and title of song. Much like the Samsung iteration, the screen-off, Glance and always-on options are well implemented and very, very useful. And, like the G6, executed on an LCD with very little apparent hit on battery. Kudos. The reason for my interest in this device is LG’s sound claims for the speaker and overall output. The LG G7 ‘Boombox’ Speaker arrangements really do make a huge difference. I have it up against the Marshall London and Razer Phone and it’s louder than both of them - almost put together! The single speaker fires out of the bottom, like most phones, but what’s different here is that there’s a big chamber across the back of the device which makes the back vibrate - and resonate when in contact with anything solid - including one’s hand! When you hold it, it’s loud - very loud - as I said above, knocking spots off any phone I’ve heard with my own ears. But then you put it down on a table (or any surface pretty much - I’ve tried in on glass, walls, doors, shower wall perspex) it booms. It really does work and most of the time I’m turning down the volume for fear of complaints. If we’re being purist here, it’s significantly louder, yes, but no - it doesn’t quite match the quality and richness of the London/Razer and their production of bass but it doesn’t seem to matter when it’s on a surface. Because of that vibration and resonance, it sounds great and becomes bass-orientated. The equaliser can be played with and I found that the Rock setting got the best quality sound out of it, but even Flat reproduces very well. According to LG, it has a mega-sized speaker-driver, 40% bigger than that on the LG G6, and has a beefier Amp. too. “...it uses its inner space as a resonance chamber to amp up the bass and deliver a premium, loud, and room-filling audio experience”. And it does! Apparently it monitors itself via software to stop any distortion at high volumes. So I’m impressed! Like other LG devices around it, the G7 offers 32-bit/192kHz audio and when using headphones with it, the difference is clear, even to my wonky old ears. I know that I usually say that music through headphones even with the cheapest equipment sounds great, but the difference is marked here with all sorts of sound adjustments available via settings, DTS X Surround Sound, Bluetooth 5 with A2DP and aptX HD support etc. Most of this stuff is fairly meaningless to me, but, like when I use the Razer Phone for watching Netflix in 5.1 Surround, it really is impressive even to the layman. I switched to the Nokia 7 Plus immediately afterwards with the same reference headphones and the difference was staggering. As with most LG top-end phones, it seems, certainly an appeal for the audiophile. There’s also an FM Radio with no record facility which sounds amazingly clear, much like you’d expect from DAB. As usual with LG and the far-east, the Camera app is festooned with all sorts of features, children’s toys, AI options, feature recognition software, a plug-in to Google Lens, Portrait Mode, Manual Mode, Cine Video Mode, there’s loads of them. There’s even a Super Bright Mode which, when engaged, opens up everything and gets the best it can out of dark situations - obviously at the expense of aperture, shutter speed and resulting noise. The most useful thing for me, though, remains the wide-angle secondary lens. OK, so it’s not got OIS or AF like the primary camera has, but having that wide-angle facility really does make a difference to me and I’m much more likely to be taking artistic shots than daily life record-shots when I have it. The main camera is a 16MP f/1.6 unit, so plenty of light getting into that wide aperture whilst the second sensor is also 16MP but with an f/1.9 aperture. The 120 degree field of view that the previous models pumped out by LG had have been narrowed down slightly on the back of their research that users had reported that it was just too wide, leading to distortion etc. The G7 wide-angle field of view is therefore 107 degrees. Still wider than most others out there and perfectly usable/useful for artistic shots. The Selfie camera is an 8MP f1.9 unit for which they use a ‘white screen’ flash arrangement when turned on. The resulting images are perfectly fine for anything but A1 posters for your wall. At the risk of sounding like a broken record, my staying power here has been tested because of all the usual stuff which you’ll probably guess, and thus far not mentioned! Why do these companies have to screw-over Vanilla so badly, I wonder. Again! It's just so annoying to have to plough through level-on-level to get to a Setting which is up-front and clear in Vanilla. Software Updates for one. Why is it inside a whole section on Updates - Update Centre? Why 4 Tabs in Settings? It has a search function for those who can’t find things! For goodness sake, leave it Vanilla so the rest of us know where stuff is! Here we go again with Apps littering the UI, the only ones of any use being LG Music & HD Audio Recorder. LG Calendar, LG Calendar Storage, LG Clock, LG Contacts, LG Email, Facebook App Manager, Facebook, Instagram, LG Gallery, HD Audio Recorder, LG Home Launcher, LG Health, LG Mobile Switch, LG Mobile Switch Launcher, LG Music, LG QuickMemo+, LG Smart Doctor, LG SmartWorld, LG Update Centre, LG Wallpaper, LG Weather. No wonder it’s stuck on 8.0.0. I give a pass on the Music app as it’s well thought out, much like Sony’s and it’s very clear when using it that you’re consuming what’s on the device not streaming, without having to remember to throw a switch. The LG Launcher offers Home, drawer, no drawer, Easy Home. No left-swipe for Google Assistant Pane in Home Screen Settings - instead you get this Smart Bulletin thing which hooks up with a load of mainly LG apps and services which have to be agreed to - so use their Calendar instead of Google’s for example - giving a screen at the left much like HTC’s BlinkFeed. An annoying long-press is needed to get to Launcher Settings (offering some layout options but not the useful ones) as however carefully you press the screen it starts moving and thinks you’re swiping. I can’t get Font/Display size right for me. Adjust font and inside Apps it’s too big, but on Home Screen too small. Same with Display. The text in the ‘ears’ of the ‘notch’ is tiny-weeny for my eyes and that doesn’t change by changing the Display ‘size’ nor font. That’s how they are. Even with a 3rd Party Launcher used. Smart Network overrides what I set. A few times I have found it not connected to my Mifi, which is assigned as Wifi, saying it can’t connect and it’s dropped. 4G auto Data Switch is off by default. NFC off by default. All these settings just seem too clever for their own good. AirDrive via LG Account? 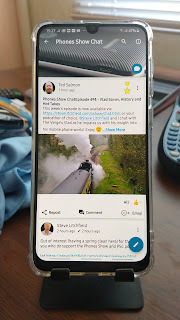 I could go on for hours about the unnecessary guff in Settings, but the next person would no doubt say that it’s great to have all those bells and whistles, fine tuning, battery optimisations, memory management, options and clever stuff going on to learn and control the phone. The Navigation controls on the Home screen are too big - and can’t be changed. Though you can make them auto-disappear, I suppose. It’s that old far-east design language of everything being big and cartoony and clunky. So, enter Nova Launcher. Phew! What a relief. Now, of course, the user is still stuck with the main Settings dialogues with their 4 Tabs which can’t be undone, but in general use you can get rid of the awful clunk that LG serves up to the uninitiated. At least this way you can lay out the screens how you want them and they’re not just annoying the user even before they start! At this point, yes, things become usable again with irritations minimised, allowing the user to focus on the range of very useful features this phone has for their enjoyment. My final thought on that is, as is so often the case with these far-east phones with their far-east ideas, please let us have an AndroidOne version for the rest of the world to use outside of Asian teenagers. Motorola are beginning to. LG are too. Nokia already are. It’s starting to happen but for now, it remains an option and many top-end functions remain elusive where they are pushed out. Anyway, these were just my thoughts. In many ways it’s a V30 with an LCD. There's plenty of commentary out there on the LG G7 which covers much more of the device's capability in finer detail and compares things often with the Samsung Galaxy range of devices. This unit is now up for sale at £375 delivered, UK only. Give me a shout!